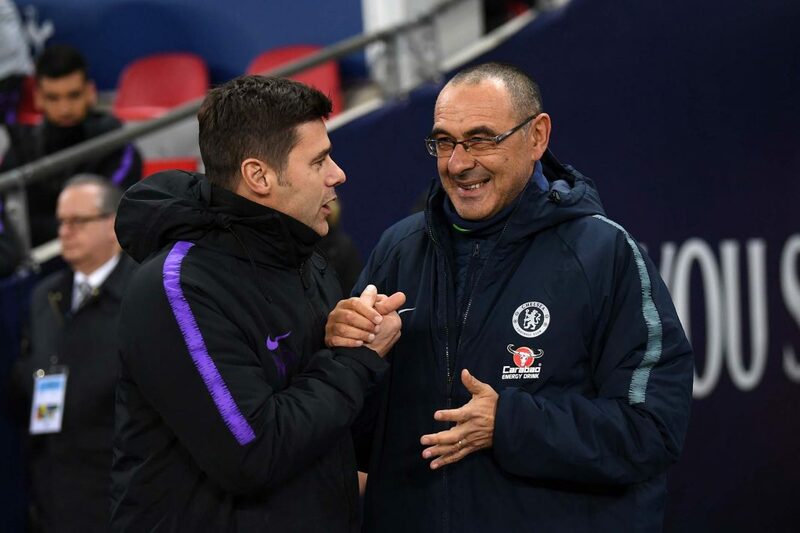 Mauricio Pochettino, Manager of Tottenham Hotspur and Maurizio Sarri, Manager of Chelsea shake hands prior to the Premier League match between Tottenham Hotspur and Chelsea FC at Tottenham Hotspur Stadium on November 24, 2018 in London. Thursday evening could be a pivotal moment for Chelsea’s 2018-2019 season and the future of manager Maurizio Sarri. After a 1-0 defeat in the first leg of the Carabao Cup semi-final, Chelsea must overturn that deficit in the second leg in order to advance to the Final against Manchester City. After the events of the past week, Stamford Bridge could be a very edgy place. A 2-0 defeat against Arsenal was bad enough. But Chelsea never looked like they could threaten Arsenal, and Sarri’s scathing remarks about his players was a calculated risk that could backfire. Chelsea’s attitude and performance against Spurs on Thursday should give everyone a glimpse of the mind-set of Chelsea’s squad, especially since the Spurs side they’ll face won’t be nearly the same as the side they faced in the first leg. Mauricio Pochettino has openly talked about the lack of transfer activity, sometimes criticising the club for their lack of activity and other times admitting that he still has a strong squad and players to call upon. His tactical nous is going to be challenged in the coming weeks, starting with Thursday night. It won’t be Sarri’s tactics that Pochettino will have to adjust to, rather it’s trying to come up with the correct solutions for his own injury-stricken side. Harry Kane and Dele Alli have both succumbed to injury over the last two weeks, and with Heung-Min Son off to join his national team for a month, Spurs look a little short of options up front. Lucas Moura is likely return from an injury that’s kept him out for the last few weeks, but he’s not really a goal scorer, and that’s their one main weakness at this moment. Not that Chelsea have been a free scoring side. The arrival of Gonzalo Higuain was finally announced today, but not in time to allow him to be registered for this match. With Alvaro Morata leaving in the future, it leaves Chelsea with just one recognised striker in Olivier Giroud, meaning Eden Hazard is likely to continue in the striking role. If Chelsea cannot get a result against a depleted Spurs side, the pressure on Sarri will be immense. His unwillingness to alter his preferred style of players has rankled some supporters who would love to see the manager be a bit more reactive to situations and opposition. Against Spurs, it’s unlikely that we’ll see any earth-shattering change after a significant defeat, as was seen when Antonio Conte famously switched to a back three. Instead, the lineup he picks on Thursday will probably be similar to the side that lost to Arsenal last Sunday. Another defeat for Chelsea against Spurs, and the calls for Sarri to leave may very well start to become louder.